Details relating to the Belgian Commemorative of 2010. 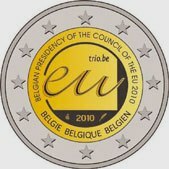 This coin was issued to celebrate the Belgian Presidency of the Council of the European Union. In the inner circle we have the stylised letters EU and above these is the inscription "trio.be". As of 2007 three countries jointly hold the Presidency for 18months. Together with Belgium, Spain and Hungary held the Presidency in 2010. Around the edge of the inner circle from eight to three o’clock is the inscription: “BELGIAN PRESIDENCY OF THE COUNCIL OF THE EU 2010”. From eight to four o’clock is the name of the country in Flemish, French and German. A little above six o’clock is the year of issue 2010 preceded and followed by the mint mark and the mint masters mark respectively. Return from Belgian Commemorative 2010 to euro coin collector.